The usual, I am afraid, a giant brand name across a pile of cartoon Chips with an ingredient identifier. There tear strips of the bags are flavour colour coded though. As with most regular cut Crisps, these munched up very quickly. They did try to hold their worth for a while, but under the pressure of no more than four munches, they were pulpy. Light, crispy and airy. lots of oil boils and thinly cut, broken Chips. There was some seasoning visible. A Nose Plunge test revealed a mild Malt Vinegar aroma. The taste was actually spot on. 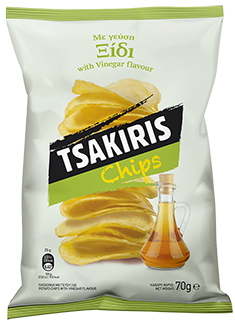 The usual flavouring is Salt and Vinegar, this is the first purely Vinegar flavour we have come across. They did indeed taste of Vinegar. This was a little disappointing because just a touch of Salt would have enhanced the flavour so much.